Holly and Polish: A Nail Polish and Beauty Blog: China Glaze Autumn Nights Winner! China Glaze Autumn Nights Winner! 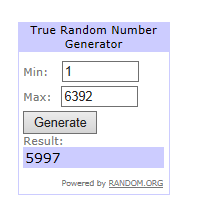 Tonight, I'm finally able to let you all know who the winner of my China Glaze Autumn Nights Giveaway is! Sorry for the delay on this! The winner was actually my 4th pick, since the first two people that were chosen weren't subscribed to me, and then the 3rd didn't respond to my email within the 48 hours. I already emailed Megan, and she has responded, so this giveaway is officially closed! I had quite a few Megans sign up for this giveaway, so if that is your name and you didn't receive an email from me, it was someone else! I should have a Christmas giveaway coming up in about a month, so keep an eye out for that! I'm trying to decide if I should do just one big giveaway or a bunch of small ones. (Maybe like 12 small ones for the 12 days of Christmas?) Let me know which you would prefer in the comments! Thanks, guys! I should be updating more this week with some new swatches! I'm always surprised at the amount of non-responders and cheaters who enter giveaways. Just a shame. Congrats to the new winner! how about 8 nights of chanukkah?? :D I always feel neglected on the blogs during the holidays.